The threat of oil pollution increases with the development of large-scale off-shore petroleum industrial activities. Recently, reducing waste materials through reuse has contributed to sustainable manufacturing in many industries. With development of large-scale poultry farming industries, the disposal of large amounts of waste chicken feathers has become a huge problem. Thus, sustainable methods for valorisation of this waste are needed. This paper examines beneficiation of waste chicken feathers via conversion into sorbents for clean-up of oil spills in water bodies to replace conventionally used synthetic adsorbents that are costly. Chicken feathers have a very high capacity for adsorption of liquid oils (up to 16.21 g of oil/g of chicken feather) at fast uptake time (10 min). The removal efficiency of oils in spills increases with increment in contact time with the sorbent. Untreated waste chicken feathers exhibited slow sorption rate for oil due to the presence of grease and other impurities on the surface of feathers. More than 85% of the oil adsorbed by chicken feathers can be recovered. Thus, waste chicken feathers show very attractive and promising adsorption/absorption properties for oil spill clean-up applications to replace polymer-based adsorbents due to their high oil absorption capacities. Both untreated and treated chicken feathers show promising potential for use as oil absorbents. Oil pollution has become one of the most serious threats to the aquatic ecosystem during the last 30 years due to the development of large-scale off-shore petroleum industry, increase in runoff of oil, increase in accidental spills, discharges of fuel from land-based sources, oil drilling accidents and increase in marine oil transportation [1-4]. Major sources of waste oil include petroleum refining, petrochemical plants, vehicle repair garages, metal and steel manufacturing industries, vegetable and animal oils in household’s wastes and abbatoir wastes [5-7]. Large quantities of oils discharged into the ecosystem can cause serious environmental problems, including adverse effects on water quality and aquatic biota, clogging of sewage treatment plants, increased chemical oxygen demand due to the large amount of bacteria necessary to decompose the oil, as well as increased biochemical oxygen demand [1-5,8-10]. Treatment of oil spills in affected waters results in improved water quality, oil recovery, protection of aquatic biota and environmental protection. Several techniques are used for removal of oily contaminants from contaminated waters; they include in-situ burning, solidification of the oils, reverse osmosis, filtration, micro-filtration, ultra-filtration, air flotation, bioremediation, gravity separation, electrocoagulation, chemical coagulation, electro-flotation and physical techniques such as booms and skimmers [1,3,11-14]. The methods can be categorized into three major groups, viz., chemical, biological and physical processes. Chemical methods are effective in oil removal from water, but they are costly and can adversely affect zooplankton, a primary food source in the marine food chain. The treated oil cannot be recovered and is thus hazardous to humans and animals [1,11]. Bioremediation is effective in oil spill removal, but it is time-consuming and its effectiveness is affected by oxygen level, temperature and organic moieties in the oil [13,15]. Recently, physical sorbents have attracted attention for oil spill removal, owing to desirable characteristics in some of them such as low environmental impact, low cost production and low energy consumption. Physical sorbents cam be grouped into three classes: natural organic sorbents, inorganic sorbents and synthetic organic sorbents. Synthetic adsorbents such as polyurethane , polyvinyl chloride and polyethene  are costly and not environmental friendly. To overcome the environmental challenge, novel synthetic organic sorbents with high oil absorption capacities, high porosity, large surface area and high degradability rate were developed, e.g., cellulose aerogels . Inorganic sorbents such as manganese oxide , bentonite , vermiculite , fly ash  and organoclay  have high oil absorption capacities. Natural organic sorbents such as peat and cotton grass fibre , rice husk and carbonized rice husk [8,23], butyl rubber , hydrophobic aquatic plants , activated carbon , other carbon-based products , coconut husk , sawdust , Kapok fibre, sugar cane bagasse , chitosan  barley straw  and other natural fibrous sorbent  have also been used for removal of oils from contaminated waters. This paper was designed to examine the utilization of waste chicken feathers in the removal of oil spills from contaminated waters as a means of physical treatment to replace the conventional synthetic adsorbents that are currently used. Feathers: Chicken feathers were obtained from Rainbow Chicken Limited slaughterhouse in the province of KwaZulu-Natal, Durban, South Africa. Cleaning agent: Sodium dodecyl sulphate (SDS) 99.0% was purchased from Sigma-Aldrich. Oil: High shear stable, multigrade engine oil formulated from crude oil (Havoline formula advanced motor oil, SAE 20W-50 was purchased from CALTEX, Durban, South Africa. Treatment of chicken feathers: Experiments were conducted with treated and untreated feathers. Freshly plucked wet untreated chicken feathers were purified by washing with a 0.5 g/L aqueous solutions of SDS to remove the grease, other wastes and kill potential harmful pathogens. Untreated waste chicken feathers (10 g) feather samples were placed in a beaker to which was added the SDS solution at a liquid to solid ratio of 40:1. The sample was agitated at 500 rpm using a magnetic stirrer with the beaker on a hot plate maintained at 50°C for 30 min. The treated feathers were further purified by rinsing in distilled water for 10 minutes and then laid on aluminium foil and dried to a constant mass at 100°C in an air-forced dryer. Thereafter the sample was placed in plastic bag that was sealed and then stored in a controlled laboratory environment (20°C, 65% relative humidity). The different portions have different characteristics and properties as previously reported. Hence the different portions were separated (manually) for independent testing. Dried treated and untreated feathers were pulverized to 350 μm size using a heavy-duty milling machine before use to increase surface areas of the feathers. Characterization of chicken feather fractions: Morphological, chemical and physical characteristics of feathers and fractions thereof have been described in a number of reports [30-32]. Morphological structures of chicken feather fractions: A closer look at a chicken feather reveals that it is comprised of three distinct units: (FIG. 1) the rachis, the central shaft of the feather that runs the entire length of the feather to which is attached the secondary branching structures; the barbs and tertiary smaller structures; and the barbules (FIG. 1b and c respectively). These morphological structures of chicken feathers were an indication of large surface areas. The rachis is composed of many individual fibres (FIG. 1d). As can be seen in FIG. 1e, the feather barbs exhibit honeycomb shaped hollow cells in the cross-section direction. The voids inside chicken feathers may be very accessible to fluids or air. The presence of hollow honeycomb structures provides high resistance to compressibility and also imparts light-weightiness to barbs and rachis. The honeycomb structure in the cross-sectional view of the chicken feathers, as shown in FIG. 1e, confirms the existence of extensive air pockets in the feathers. The images in FIG. 1e confirm that the microstructure of feathers is nearly round; the medulla in coarse fibres are concentric and irregular in size. Any adsorbent material intended to remove oil from water surface should ideally float since oil tends to float on water. The presence of extensive air pockets (honeycomb structure) in the structure of waste chicken feathers imply that feathers can float on top of the water and could thus act as superabsorbent materials for oils present on water surface. The presence of hooks, hooklets, rough surface appearance, entangled pores and knots in the chicken feather structure enhance the oil retention properties . FIG. 1. 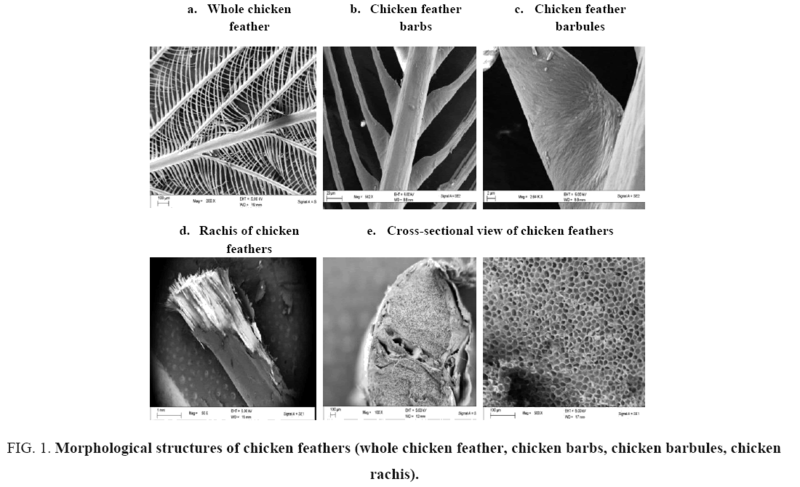 Morphological structures of chicken feathers (whole chicken feather, chicken barbs, chicken barbules, chicken rachis). 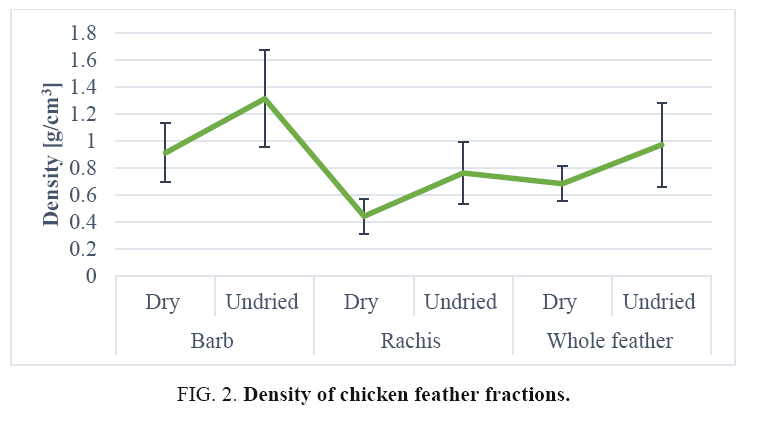 Density of chicken feather fractions: The density values of various chicken feather fractions are shown in FIG. 2. The density of whole feathers and feather fractions showed clear differences among them but that of the whole feather was very close to that of the barb density in almost all cases. The mean relative density of the barbs was 0.91 g/cm3 with Cv 24.29%, a relatively low variation indicative of sample homogeneity. The data in FIG. 2 show that the mean recorded relative density of rachis was 0.44 g/cm3 with Cv 28.99%, a relatively low variation indicative of sample homogeneity . The mean density of whole chicken feathers was 0.68 g/cm3 with Cv 18.91% again, the Cv was relatively low and indicative of sample homogeneity. SEM micrographs of cross-sections of a rachis (FIG. 1) show an open cell porous structure, which very probably, is responsible for the low-density value of the rachis. The mean wet density of rachis was 0.76 g/cm3 with Cv 27.48%, a relatively low variation indicative of sample homogeneity. The mean density of whole chicken feathers was 0.97 g/cm3 (Cv 31.96%) and barb was 1.31 g/cm3 (Cv 30.26%): Again the Cv is relatively low and indicative of sample homogeneity. The result from FIG. 2 shows that the density of chicken feather fractions after drying, indicating that a significant amount of moisture was present in the fractions. The density of chicken feathers and fractions thereof, were measured to be 0.44-0.91 g/cm3: these values correlated well with literature values for protein and cellulosic fibre but were lower than those of animal and plant fibres such as wool (1.31 g/cm3), silk (1.27 g/cm3), jute (1.3 g/cm3), coir (1.2 g/cm3) and cotton (1.5-1.6 g/cm3), etc. As it seen clearly in the Figure no natural or commercially available synthetic fibres today have a density as low as that of chicken feathers. Considering that the density of chicken feather fractions they could float in water. FIG. 2. Density of chicken feather fractions. Hydrophobicity analysis of chicken feather fractions: Chicken feathers contain approximately 91% protein (keratin), 1% lipids and 8% water. The amino acid sequence of a chicken feather is precisely the same as that of keratin from reptilian claws . The amino acid sequence is mainly composed of cysteine, glutamine, proline and serine as shown in TABLE 1. Serine (16%) is the most abundant amino acid in chicken feathers. As can be seen clearly in the table the chicken feather fractions are therefore highly hydrophobic and partially hydrophilic (TABLE 1). TABLE 1. Amino acid content in keratin fibre from chicken feathers . The majority of the amino acids present in chicken feathers are hydrophobic in nature . As shown in FIG. 3, also it is evident that cotton and wood pulp were aggregate in the second layer (water layer) showing the complete wettability of the fibres. However, the chicken feather fractions (barb and rachis) aggregated in the interphase between the water and ethyl ether layers. 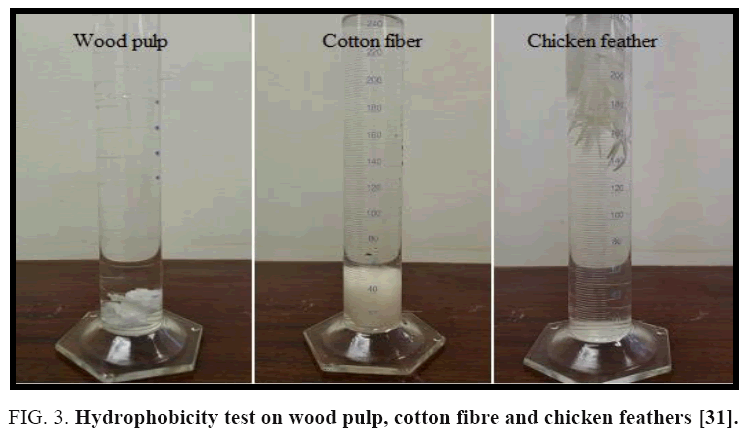 This indicates poor wettability of chicken feather fractions compared with cotton fibre and wood pulp; these observations confirm the hydrophobic properties of chicken feather fractions . Being hydrophobic in nature, the feathers will naturally be attracted and bind to the hydrocarbons in the oil until they are saturated. Thus, chicken feathers are ideal materials for oil adsorption. A nonwoven or handsheet can be made from waste chicken feather to be used for oil removal from contaminated waters [32,34]. FIG. 3. Hydrophobicity test on wood pulp, cotton fibre and chicken feathers . BET analysis of chicken feather fractions: As it is seen from FIG. 4 and 5, the physiosorption property of the chicken feather fractions (barb and rachis) show significant differences in BET surface area. The difference in surface area of both samples may be due to the microstructural difference between the two samples as can be seen in the morphology characteristics (FIG. 1). Since the pore size of both fractions falls in between 2-150 nm, it can be concluded that the chicken feather fractions were mesoporous and microporous material. The surface area of the rachis was 1.25 m²/g with a single point surface area at P/Po=0.20:1.29 m²/g. The pore volume of barb for single point adsorption total pore volume of pores less than 168.91 nm diameter at P/Po=0.99 was 0.02 cm³/g. The chicken feather rachis has a pore size of adsorption average pore width (4V/A by BET) 55.47 nm, BJH adsorption average pore diameter (4V/A):42.92 nm and BJH desorption average pore diameter (4V/A):28.78 nm. The surface area of the barb was 0.7845 m²/g with a single point surface area at P/Po=0.20:0.87 m²/g. The pore volume of barb for single point adsorption total pore volume of pores less than 139.39 nm diameter at P/Po=0.99 was 0.01 cm³/g. The chicken feather barb has a pore size of adsorption average pore width (4V/A by BET): 40.29 nm, BJH adsorption average pore diameter (4V/A):87.03 nm and BJH desorption average pore diameter (4V/A):25.81 nm. FIG. 4. BET Specific surface area analysis of chicken feather fractions (Tesfaye et al., 2017 (a)). FIG. 5. Adsorption/Desorption isotherm of chicken feather fraction . FIG. 4 shows the BET specific surface area of chicken feather fractions. It can be seen that the rachis data were much more linear and the data is uniformly distributed compared to that of the chicken feather barbs. FIG. 4 demonstrates that the amount of the adsorbed nitrogen is noticeably lower for barb compared to the rachis part. This region is representative of adsorption in micropores, which are the internal adsorption sites inside the chicken feather fractions. These results showed that the material produced from rachis has very stable adsorption and desorption characteristics resulting in the higher surface area compared to material produced from chicken feather barbs. Nitrogen adsorption/desorption isotherms at 77 K of the barb and rachis of the chicken feather samples are shown in FIG. 5. Both fractions exhibited the type-III isotherms and explain the formation of multilayers. FIG. 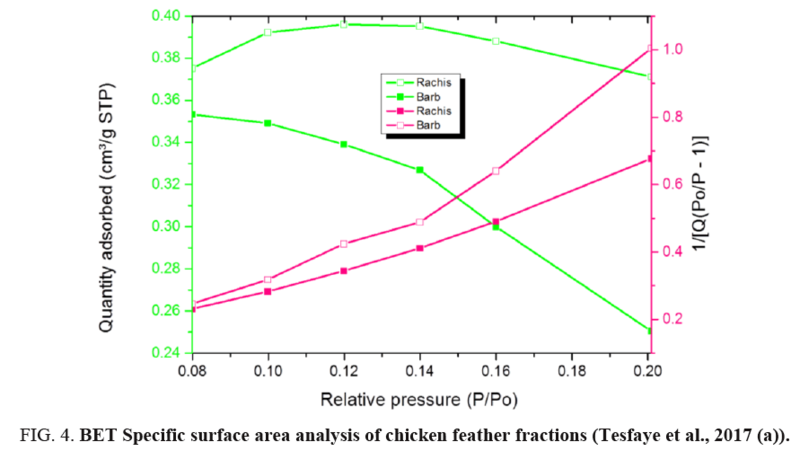 5 shows considerable differences between the adsorption/desorption isotherms of barb and rachis of the chicken feather: the uptake amount at low pressure by rachis were much higher than barb this is the indication for the presence of more mesopores. The uptake of nitrogen at very low pressures is due to mesopore and micropores filling from the enhanced adsorbent-adsorbate interactions in the mesopores and is distinct from adsorption in macropores because adsorption in mesopores material is due to multilayer adsorption and capillary condensation. FIG. 6-7 show the obtained pore size distribution of chicken feather fractions. The chicken feather fractions have both micropores and mesopores. The pore size distribution shows a maximum at the pore size of 11.8 nm for rachis and 2.89 nm for barb. There is a secondary maximum at a pore size of around 13.95 nm for rachis and 37.55 nm for barb and there are pores in the larger microporous and mesoporous regions, but all these pore distributions are much smaller than the primary maximum. FIG. 6. 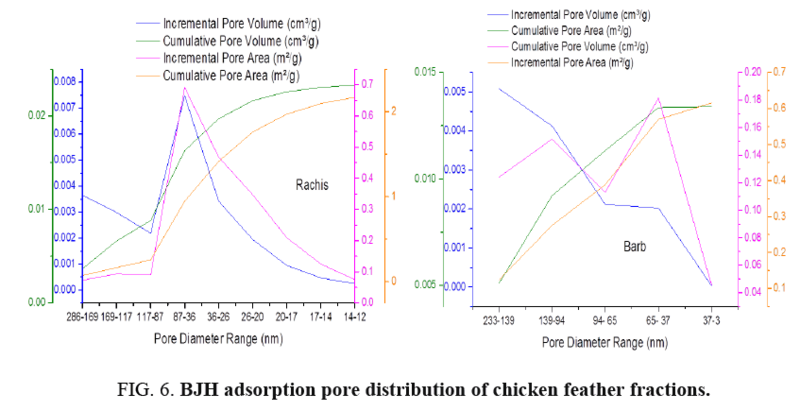 BJH adsorption pore distribution of chicken feather fractions. FIG. 7. 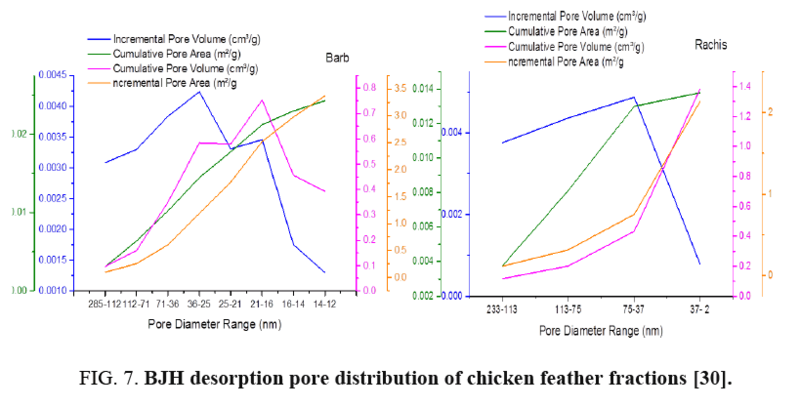 BJH desorption pore distribution of chicken feather fractions . Motor oil is immiscible with water; hence it floated on the surface of artificial seawater. In all sets of experiments the chicken feathers did not sink to the water layer but floated and interacted with the oil layer: this is possibly due hydrophobicity and oleophilicity of the feather fractions (FIG. 8). These are important properties of chicken feathers and that are an indication that chicken feathers would interact with and adsorb oil at the surface rather than sink and mix with the water below the oil slick. This observation further confirmed that the surfaces of chicken feather fractions were hydrophobic in nature (FIG. 3) and only absorbed oil selectively. FIG. 8. (a) Simulated oil spill; (b) chicken feather fraction floating on top of the oil layer; (c) chicken feathers saturated with adsorbed oil after 30 minute contact time; and (d) material remaining after removal of the feathers. The oil adsorption capacities of the chicken feather fractions were evaluated and are depicted in FIG. 9. It is evident that treated chicken feather fractions could absorb oil to about 16 times of its original weight. On the other hand, untreated waste chicken feathers only absorbed oil to about 6 times of its original weight. This is due to the presence of high grease content and other waste contaminants on the surfaces of raw untreated waste chicken feathers (FIG. 9). 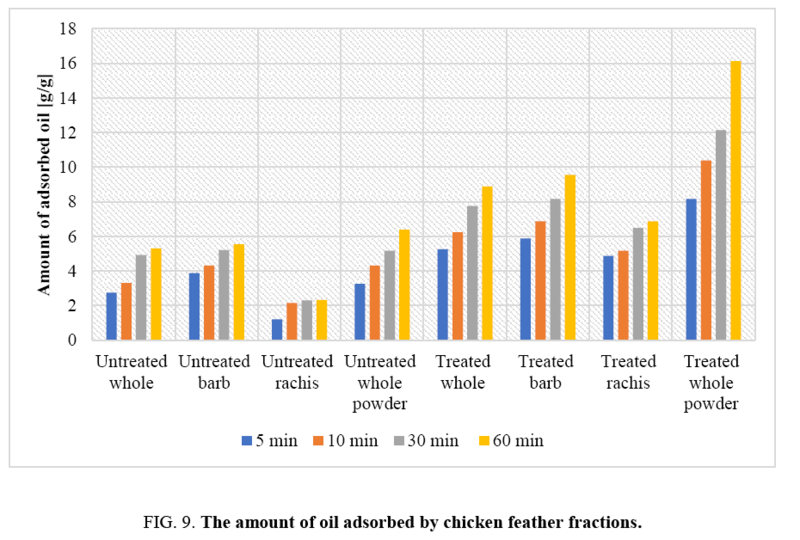 The treated chicken feather fractions absorbed oil rapidly as shown in FIG. 9. The result from oil absorption experiment indicates that there was a statistical significant difference between the amount of absorbed oil by untreated and treated chicken feather this is due to the removal of greases and other waste materials from waste chicken feather that could hinder absorption. The high rate of sorption of the oils onto chicken feather fractions can be attributed to the hollow structures, hydrophobic characteristics, high keratin content and strong disulphide bonding in the materials. FIG. 9. The amount of oil adsorbed by chicken feather fractions. The oil absorption capacity of chicken feather fractions as a function of time is shown in FIG. 9. It is clear that as the adsorption time increases the amount of oil adsorbed by chicken feathers increases. There is an increase in oil absorption of about 35% when the contact time is increased from 5 min to 30 min. It can be seen in FIG. 9 that the rate of oil uptake in the adsorption process was rapid initially in the first 10 min and the weight of adsorbed liquid oil had reaching equilibrium in about 30 min, indicating that the chicken feather fractions were saturated. The observed initial rapid sorption may be due to the movement of oil molecules from the higher concentration regions to the surface of the adsorbent. The data indicate that 30 minute contact time would be ideal for oil spill cleanups. The data also show that whole chicken feathers were more effective in oil removal than individual feather fractions. Thus, there is no need to fractionate the feathers. Oil desorption capacity of chicken feather fractions: The oil recovery efficiency of the chicken feather fractions adsorbent properties were evaluated by pressing using a Carver hydraulic press. FIG. 10 shows that substantial amounts of the adsorbed/absorbed oil (85-95%) were recovered from the chicken feather fractions and the recovery was low for chicken feather powders. This could be due to the adsorption of oil on the surface is greater than its absorption in the void of chicken feathers and the oils are attracted and held to the chicken feather fractions surface, including internal fibre walls by physical bonds that becomes easily broken on pressing. The adsorbed sorbates on the surfaces are easily desorbed than the sorbates absorbed within the voids. FIG. 10. Amount of recovered oil from chicken feathers fractions. Both treated and untreated waste chicken feather fractions were evaluated for their potential beneficiation as oil spill sorbents from contaminated waters. Treated chicken feather fractions absorb oil up to about 16 times their weights whereas untreated waste chicken feathers only absorbed oil up to about 6 times of its original weight due to high grease content and other waste contaminants on its surfaces that impeded oil adsorption. Characteristics of feathers such as oleophilicity, hollow structure, high keratin content, pore size and volume distribution, indicate that chicken feathers are ideal oil spill sorbents. The only processing requirement on feathers for such application is pre-treatment to degrease and decontaminate the materials from microbial contamination. From the experimental results it can be concluded that the rate of oil uptake in the adsorption process was rapid initially in the first 10 min and then gradually increased with increase in contact time up to 30 minutes. Both untreated and treated chicken feathers show promising potential as oil absorbents as they are available abundantly and exhibit high oil absorption capacity. However, use of untreated feathers is not recommended due to the hazardous nature of the waste products. Thus, the only processing requirement on feathers for such application is pre-treatment to degrease and decontaminate the materials from microbial contamination. The effects of contact time, the weight of adsorbents, viscosity of oil and the concentration of adsorbate and temperature on the oil adsorption will be studied and optimized in the future. The authors are highly grateful for the financial and technical support received from: The Institute of Technology for Textile and Fashion Design/EiTEX at Bahir Dar University, Ethiopia; the Thermodynamics Research Unit at the Discipline of Chemical Engineering, University of KwaZulu-Natal; the Biorefinery Industry Development Facility, Council for Scientific and Industrial Research (CSIR) and the Department of Science and Technology, Waste Research Development and Innovation Roadmap. Adebajo MO, Frost RL, Kloprogge JT, et al. Porous materials for oil spill cleanup: A review of synthesis and absorbing properties. J Porous Mat. 2003;10(3):159-70. Ahmad AL, Sumathi S, Hameed BH. Residual oil and suspended solids removal using natural adsorbents chitosan, bentonite and activated carbon: A comparative study. Chem Eng J. 2005;108(1):179-85. Ali N, El-Harbawi M, Jabal AA, et al. Characteristics and oil sorption effectiveness of kapok fibre, sugarcane bagasse and rice husks: oil removal suitability matrix. Environmental Technol. 2012;33(4):481-6. Al-Obeidani SKS, Al-Hinai H, Goosen MFA, et al. Chemical cleaning of oil-contaminated polyethene hollow fibre microfiltration membranes. J Membrane Sci. 2008;307(2):299-308. Almeda R, Wambaugh Z, Wang Z, et al. Interactions between zooplankton and crude oil: Toxic effects and bioaccumulation of polycyclic aromatic hydrocarbons. Plos One. 2013;8(6):67212. Atlas RM. Microbial hydrocarbon degradation-bioremediation of oil spills. J Chem Technol Biotechnol. 1991;52(2):149-56. Banerjee SS, Joshi MV, Jayaram RV. Treatment of oil spill by sorption technique using fatty acid grafted sawdust. Chemosphere. 2006;64(6):1026-31. Brandão PC, Souza TC, Ferreira CA, et al. Removal of petroleum hydrocarbons from aqueous solution using sugarcane bagasse as an adsorbent. J Hazardous Mat. 2010;175(1):1106-12. Ceylan D, Dogu S, Karacik B, et al. Evaluation of butyl rubber as a sorbent material for the removal of oil and polycyclic aromatic hydrocarbons from seawater. Environmental Sci and Technol. 2009;43(10):3846-52. Feng J, Nguyen ST, Fan Z, et al. Advanced fabrication and oil absorption properties of super-hydrophobic recycled cellulose aerogels. Chem Eng J. 2015;270:168-75. Goodbody-Gringley G, Wetzel DL, Gillon D, et al. Toxicity of Deepwater Horizon source oil and the chemical dispersant, Corexit® 9500, to coral larvae. Plos One. 2013;8(1):45574. Ibrahim S, Ang HM, Wang S. Removal of emulsified food and mineral oils from wastewater using surfactant-modified barley straw. Bioresource Technol. 2009;100(23):5744-9. Kabiri S, Tran DN, Altalhi T, et al. Outstanding adsorption performance of graphene-carbon nanotube aerogels for continuous oil removal. Carbon. 2014;80:523-33. Khan E, Virojnagud W, Ratpukdi T. Use of biomass sorbents for oil removal from gas station runoff. Chemosphere. 2004;57(7):681-9. Lim TT, Huang X. In situ oil/water separation using hydrophobic-oleophilic fibrous wall: A lab-scale feasibility study for groundwater cleanup. J Hazardous Mat. 2006;137(2):820-6. Mysore D, Viraraghavan T, Jin YC. Treatment of oily waters using vermiculite. Water Research. 2005;39(12):2643-53. Okiel K, El-Sayed M, El-Kady MY. Treatment of oil-water emulsions by adsorption onto activated carbon, bentonite and deposited carbon. Egyptian J Petroleum. 2011;20(2):9-15. Rico-Martínez R, Snell TW, Shearer TL. Synergistic toxicity of Macondo crude oil and dispersant Corexit 9500A® to the Brachionus plicatilis species complex (Rotifera). Environmental Pollution. 2013;173:5-10. Said AEAA, Ludwick AG, Aglan HA. Usefulness of raw bagasse for oil absorption: A comparison of raw and acylated bagasse and their components. Bioresource Technol. 2009;100(7):2219-22. Saravanan K. Exploration on Amino acid content and Morphological Structure in Chicken Feather Fiber. J Text App Tech Management. 2012;7:1-6. Solisio C, Lodi A, Converti A, et al. Removal of exhausted oils by adsorption on mixed Ca and Mg oxides. Water Res. 2002;36(4):899-904. Suni S, Kosunen AL, Hautala M, et al. Use of a by-product of peat excavation, cotton grass fibre, as a sorbent for oil-spills. Marine Pollution Bulletin. 2004;49(11):916-21. 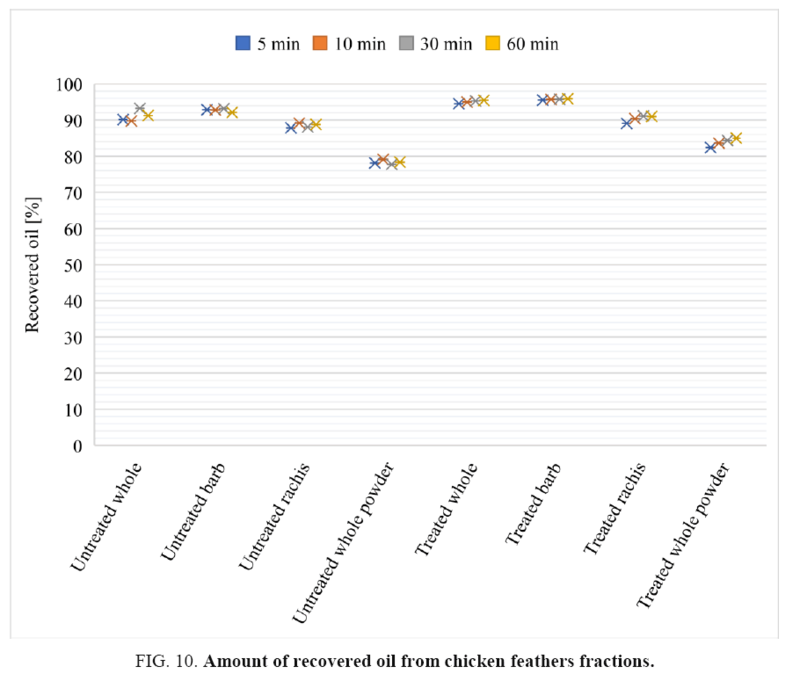 Tesfaye T, Sithole B, Ramjugernath D. Valorisation of chicken feathers: Recycling and recovery routes. Proceedings, Sardinia 2017. 16th Int Waste Management and Landfill Symposium/2-6 October 2017. S. Margherita di Pula, IWWG: International Waste Working Group, CISA Publisher. Sardinia, Cagliari, Italy. 2017;p:511. Tesfaye T, Sithole B, Ramjugernath D, et al. Valorisation of chicken feathers: Characterisation of physical properties and morphological structure. J Cleaner Prod. 2017;149:349-65. Tesfaye T, Sithole B, Ramjugernath D, et al. Valorisation of chicken feathers: Characterisation of chemical properties. Waste Management. 2017;68:626-35. Tesfaye T, Sithole B, Ramjugernath D, et al. Valorisation of chicken feathers: Application in paper production. J Cleaner Prod. 2017;164:1324-31. Vasudevan N, Rajaram P. Bioremediation of oil sludge-contaminated soil. Environment International. 2001;26(5):409-11. Vlaev L, Petkov P, Dimitrov A. et al. Cleanup of water polluted with crude oil or diesel fuel using rice husks ash. J Taiwan Institute of Chem Eng. 2011;42(6):957-64. Wahi R, Chuah LA, Choong TSY, et al. Oil removal from aqueous state by natural fibrous sorbent: An overview. Separation and Purification Technol. 2013;113:51-63. Wang D, McLaughlin E, Pfeffer R, et al. Adsorption of oils from pure liquid and oil-water emulsion on hydrophobic silica aerogels. Separation and Purification Technol. 2012;99:28-35. Wu L, Li L, Li B, et al. Magnetic, durable and superhydrophobic [email protected] [email protected] [email protected] fluoropolymer sponges for selective oil absorption and oil/water separation. ACS Applied Materials & Interfaces. 2015;7(8):4936-46. Wu J, Wang N, Wang L, et al. Electrospun porous structure fibrous film with high oil adsorption capacity. ACS Applied Mat and Interfaces. 2012;4(6):3207-12. Zainudin NF, Lee KT, Kamaruddin AH, et al. Study of adsorbent prepared from oil palm ash (OPA) for flue gas desulphurisation. Separation and Purification Technol. 2005;45(1):50-60. Zhu H, Qiu S, Jiang W, et al. Evaluation of electrospun polyvinyl chloride/polystyrene fibres as sorbent materials for oil spill cleanup. Environmental Sci and Technol. 2011;45(10):4527-31.